I’m happy to introduce the most recent free line art for you! Today’s star is Ariel, specifically from the Part of Your World Reprise. Like I mention in the video, I love that song (though to be fair, I love practically every Little Mermaid song). Especially from the Broadway musical. Rocks: W3, E18, E99, E39? To clarify from the video, I used the clouds as a way to tie everything together. 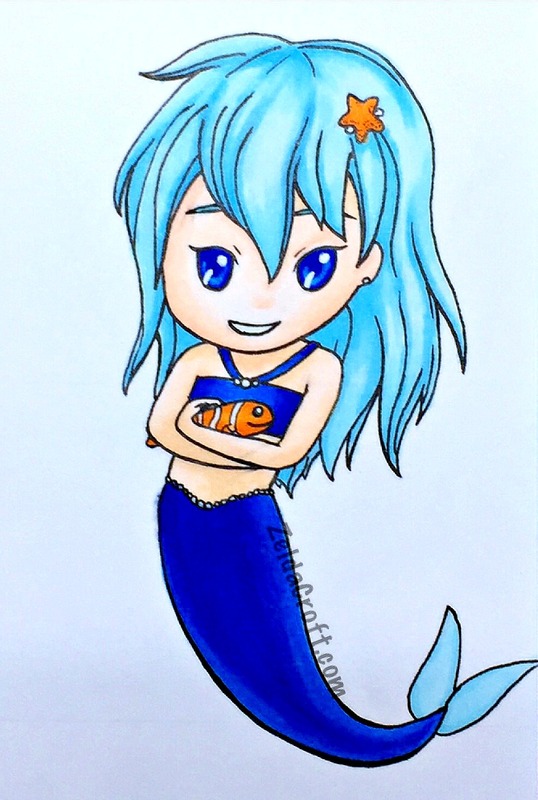 As you can see from the list, I used colors from her fin, eyes, and the ocean unify the different elements. Because her hair, shell, and tail colors are solely used on their respective aspects, they stand out against the background. In hindsight, I would have made Ariel’s pose more dynamic. She’s a little stiff, but I hope you’ll still like her. You can find Ariel and my other free coloring pages here, or on the navigation bar above. If you share on Twitter or Instagram be sure to tag me (@ZeldaCroft). I’d love to see your coloring! Do you want to color Ariel? What other coloring pages would you like to see? Let me know in the comments! This week I was still inspired from last week’s chibi class and writing about MerMay, which could only lead to one thing: a chibi mermaid. I actually used an extra paper from the class prep that had chibi proportion guide lines on it. You don’t need to draw them every time to ensure the head to body ratio, but I figured I would use it to make things easier. Like most mermaids, she needed an aquatic companion. Since I wanted her to be mostly blue, I thought an orange clown fish would be nice contrast. I also decided to give her little pearls and a starfish barrette to add some cute details. Fish are friends, not food. Well, in this picture anyway. The idea is that she is hugging her little fish. But when I showed my mom the sketch she said, “It’s cute but she’s not going to…eat it…is she?” No, it’s just supposed to be her buddy. So I’m not sure how successful that part of the picture is, but I’m really happy with the coloring. I’ve been improving with my Copic markers lately and am also trying to be more aware of using color thoughtfully. By only using one orange and two blue blends (plus a peachy skin color), the image feels unified. I like her. I actually filmed about half of the coloring for a short YouTube video, but my phone ran out of space. Before I realized it stopped the recording the drawing was almost done. Oh well. I’m not officially doing MerMay, but I’d like to contribute a couple more mermaids this month. You can expect a blog post or two in the next couple weeks about them, or follow me on Instagram to see the progress of more mermaid-y drawings. Last summer, I was packing up for a week trip to my grandparent’s cabin. It’s a beloved little retreat on the side of a mountain, tucked in a forested valley. Sounds peaceful, right? I love going there, but was faced with a well-known dilemma for artists: what supplies do I bring? With dreams of sketching squirrels and woods, I wanted to bring the usual pencils and micron pens, plus some Copic markers. Faced with the pleasant reality of having too many Copics for my pencil case, I chose a few of my classic Cool Grays, a bold red (R29, I think), and a nice green (maybe G24?). In the end, I drew neither critters nor trees. 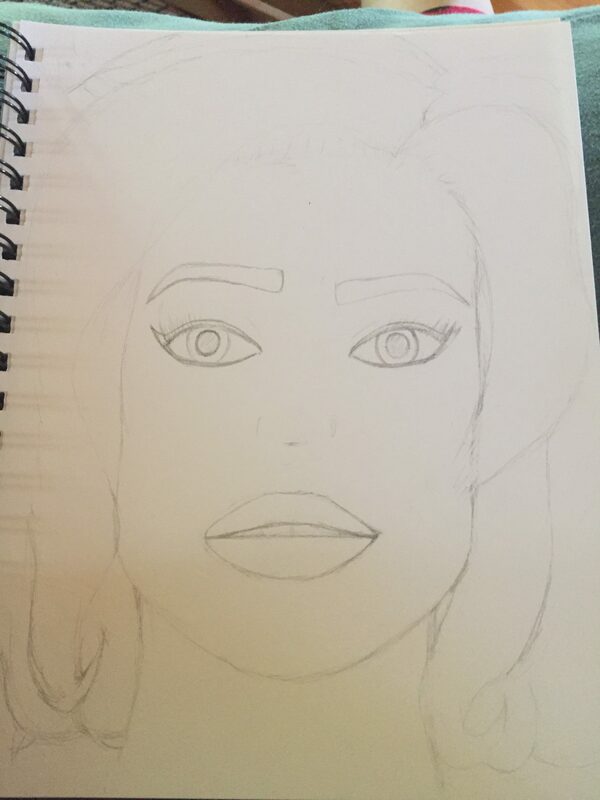 Before leaving, I had a vague idea of a woman, maybe in a 50’s/60’s style. She would be all in gray, with bright red lips. Hence, my color selection of markers. This was drawn in a Canson XL Mixed Media sketchbook. One night, with a lamp’s gentle glow and an HB pencil, I started doodling. Running with that concept, I loosely sketched her face and hair. For better or worse, I just drew what felt right, without really thinking of what emotion or style to use. It was one of those times where the drawing sort of comes together on its own. The sketch looked a little odd to me, but I hoped it was just the intensity of her expression. Given this was just for fun, I went ahead and inked with a Micron Brush pen for the hair and a Micron Pigma pen for the facial features. This picture was taken at an angle, so the jaw looks bigger than it is. 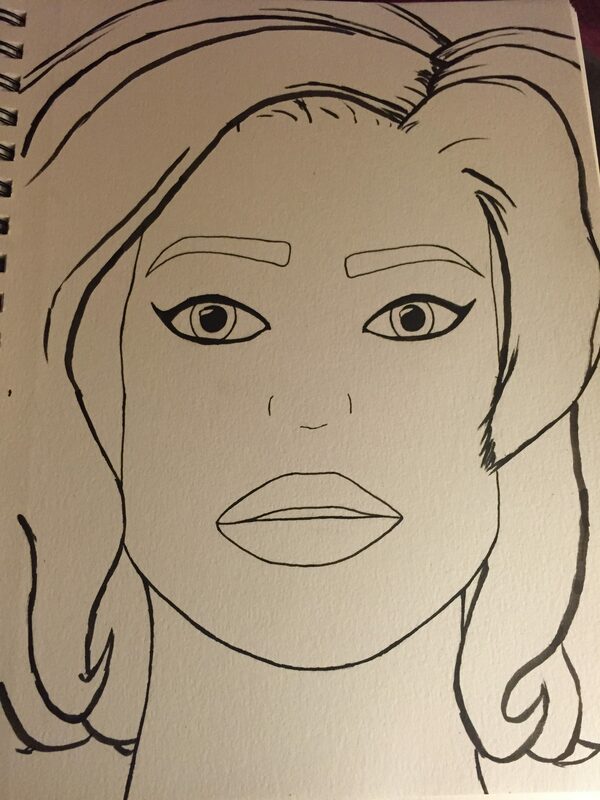 Inking helped her face look a little better. 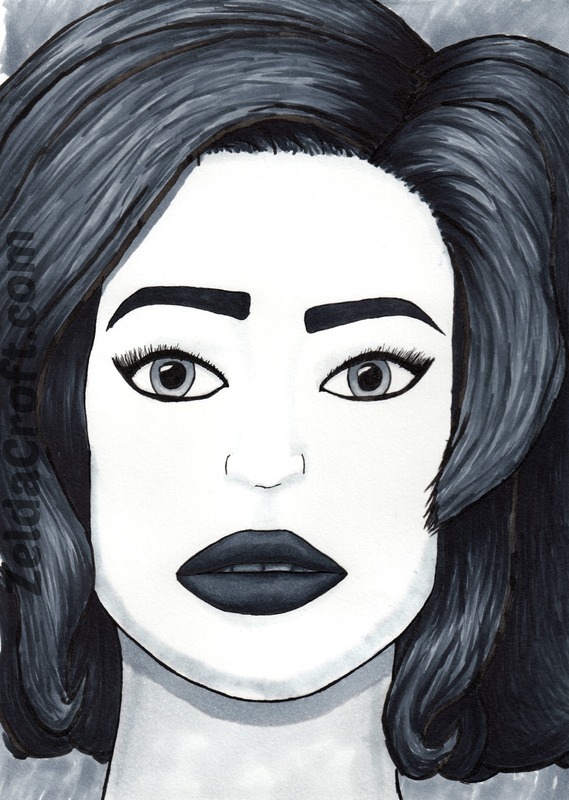 I was (and still am) inexperienced with ink brushes, so her hair lines are really uneven. Thankfully, you can’t tell too much once it’s colored. And by colored, I mean grayed. Red seemed too bold for this picture after the cool gray hair. It began to have an old photograph feel to it, and it seemed like crimson would compromise that. Like the sketching, I took a pretty loose approach to using the markers. Creating without an exact vision or expectation was a freeing experience. Her hair came first. The coloring ran dangerously close to being overworked, I thought, but in the end I was surprised by how much I liked it. The mouth was successful, too. I was nervous about the teeth. Teeth are so easy to make creepy: either they’re too realistic or too cartoony. Hers were surprisingly realistic—in that vintage photo sort of look I ended up going for. At the same time, I like the contrast between her dark hair and pale face. I just wish I could’ve done that while giving her some more facial dimension. Semi-realism is something I’ve played with a little bit since this work, and definitely want to keep trying out. All-in-all, this was a fun drawing. I learned more about using Copics and rendering a style different from my usual default. The relaxing atmosphere of a cozy cabin night likely had something to do with that. This week’s art actually arose out of some confusion. I heard about a drawing contest from Crunchyroll, who was celebrating having one million premium members. As a premium member myself, I wanted to participate. Not to mention the GIGANTIC prize pack of anime movies, game systems, merchandise, and more. The contest said to draw ‘Hime’ in a creative way. Easy enough. I know drawing a chibi isn’t especially creative (at all), but it would be fun and is what I was inspired to do. So, naturally, I started drawing Hatsune Miku. For those of you who know these characters, feel free to laugh at my mistake. I audibly laughed myself when I realized. Maybe my over-tired brain translated Hime to the ‘H-’ in Hatsune and ‘Mi-’ from Miku. I wasn’t super familiar with the latter character, but Hime? Ironically, I read her 4-panel manga every couple weeks. I just never paid much attention to her name. After registering that I confused Crunchyroll’s mascot character for a Vocaloid video game one, I decided to finish Miku-san and start Hime the next day. I came up with an actually creative idea for Hime, but I felt sick with a cold before I could get started. It was also the last day of the contest. I don’t claim to be able to draw in an authentic Japanese style, but I like this chibi. She has a little bit of my style to her, and is cute and simple. I thought of doing some kind of background, but figured she was better left with a little drop shadow under her back foot. Having never played a Vocaloid game, I don’t know if she succeeds totally as her character. From reference pictures she seemed to dance and be joyful on stage. That’s what I tried to capture. Also her hair. I see why it’s iconic- it’s also fun to draw and color. Parts of her outfit were surprisingly intricate, so I simplified or omitted some to keep with the typical simplicity of chibis. As a side note, I looked up her music during my research. A lot of it is a little too ‘electronic’ for my tastes (she is an artificial vocal synthesizer, after all), but it was still nice to listen to. If you’d like to see more chibis from me, stay tuned; I’ll be teaching a class to local homeschoolers next month. In that blog I’ll share with you what I taught them, including tips and resources for future chibi drawings. Happy Breath of the Wild Day! Words cannot express my excitement. I’ve got so many things in the works right now it’s hard for me to find any words. But I’ll try. If you just want to read about the drawing, you can skip down a few paragraphs. But to mark the occasion, I just wanted to explain a little more about myself and why the Legend of Zelda series is so special to me. I won’t go into it too much, but the series has always been a bright spot for me. When things weren’t happy at home and I was feeling lonely, video games were a place I could go to feel…different. Better. Not that escapism is always the best thing, but besides reading my books it was healing to go and be a hero. The Legend of Zelda, with its brilliant scores and captivating stories, characters, and gameplay was an uncontested favorite of mine. Before I really became interested in drawing, I used to novelize the games. Specifically, I did this as a pre-teen when I started playing Twilight Princess. I’d write about Link and Epona racing across Hyrule Field, or strategically taking down Moblin archers in a hidden village of cats. Maybe I’ll post them sometime. So, you can understand why I’m looking forward to Breath of the Wild. It looks like it will tell a new story with new features, while retaining the unique feel of a Zelda game. The trailer released during the Switch presentation for BotW was incredibly inspiring to me. I genuinely teared up. Right after, ideas for fan art sketches kept popping up in my head. The Zelda from today’s video, though, was rather spontaneous. I was looking at a Princess Ruto drawing I had done back when I first bought Copic markers a few years ago. Without really knowing what I was doing, I chose a 9×12 sheet of paper- fairly big for a test run. It made blending more difficult as a beginner, but having a larger image in the end was nice. Though not intended as a series, I wanted to make another drawing like that one. Especially now that I am more familiar with Copics as a medium. Princess Zelda was an obvious choice, as her personality and character design are so prevalent in the trailer. So a loose sketch became a more structured one. It was all going pretty smoothly until I started looking at the details of her ‘adventure’ outfit. On one hand, it was cool to see just how much thought went into an otherwise simple design. Like Kotaku wrote in their article on it, the simple touches make it look like a princess’ elegant but functional outfit. On the other hand, it was an unexpected challenge to get all of those details correct. Because there are still limited images available, I ended up using those and painstakingly scrubbed (minutely fast-forwarded and rewinded) stills from the trailer. As you can see in the video, I used a yellow color, Y08, on her gold accents, then went over it with another color to make it more golden, with Y28 as the shadows. I didn’t have exact colors to match her gold, but I think what I did comes close. To tie it all together, I used Y08 as the base for her hair as well, though this time leaving it to be a main color. Once she was done, I turned my sights on the background. There wasn’t much room left around her, but I wanted some notion of BotW’s vast landscape. You can see my test picture on my Instagram; I took the rough mountain shape from reference pictures, and went with a traditional purple to green transition to show the distance. Plus little trees. The little bushes at the bottom in the foreground didn’t quite turn out how I wanted them too. They still work to separate the midground, though. I don’t have much experience with backgrounds, but that’s something I’d like to change. For this work I think it turned out nicely. After everything, I thought the sky would be an easy light blue gradation. Nope. I found the perfect blue color, B00, as the lightest. But after I started going along the mountains, I noticed that it was, indeed, dead. Thankfully I scraped out enough color to cover the areas I needed, but the result was streaky. I tried to save it with the other blues, but none of my other colors were close enough to blend with it effectively without ruining the effect. The focus on slight symmetry gives it a portrait-like quality, I think. Given Zelda’s royalty, it suits her. I don’t know much of the story yet, but I hope my art was successful in portraying her out in Hyrule, concerned about saving her people but still strong. That quality of vulnerable strength is something I’d like to play with in other works, especially with some characters in this series. So what do you think? Will you be playing Breath of the Wild soon? I’d love to hear in the comments below! In celebration of Breath of the Wild’s release, I’ve decided to do a mini “Zelda-thon”. I’ll have Zelda book reviews and fan art over the next few days, so be sure to stay tuned! 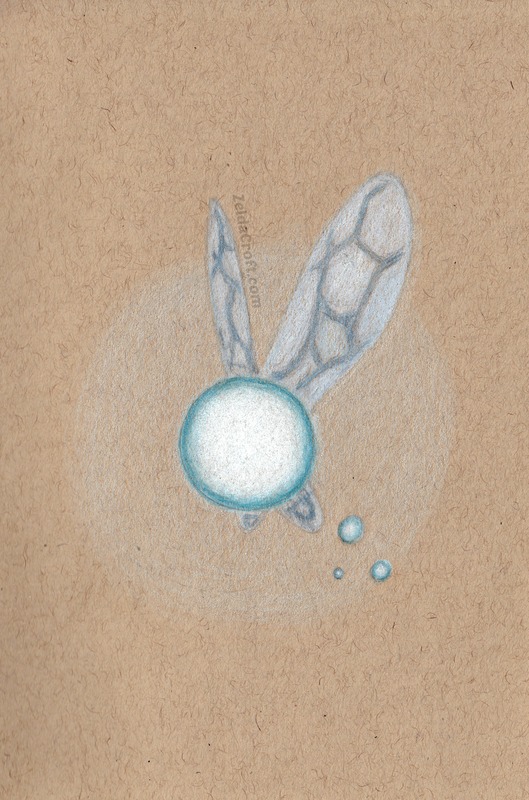 Of course it wouldn’t be a celebration of the Legend of Zelda without Navi, so I thought she’d be good fit to kick off this little Zelda-thon. Love her or hate her, she is a very integral part of one of the best Zelda games (in my opinion and many others). She’s also the first partner Link has had in a game. Zelda Universe has a long article about her that fully analyzes the character and opinions about her from fans. It’s interesting to read, and goes surprisingly deep into her personality and contributions to the player. Essentially, from a poll run with their fans it rated Navi as an okay figure who is both helpful and annoying. I know my opinion of Navi has changed over the years. As a kid, when I just wanted to do what I wanted to (as in, fish for hours trying to catch the elusive beast-fish), her constant reminders that Saria is in trouble or I need to hurry to somewhere else were bothersome. But I’ve come to really appreciate her. Her design is beautifully simple, and is now filled with happy nostalgia for me. Playing through Ocarina of Time 3D, she’s actually quite helpful. If you want to know the names and weaknesses of your enemies, she’s your girl, er, fairy. About the artwork itself, I’ve been wanting to use my toned tan paper from Strathmore for a while now. And after completing this Friday’s artwork (coming soon! ), I really wanted to make something fairly simple. It was made with my Prismacolor Premier colored pencils. They have a soft lead, which is great for building up gradients and lightly applying tone. It only took about an hour to complete. I could easily have kept going with the gentle shading of her aura and body, but I was reaching a point of potentially overdoing it. My first Zelda game was given to me by my mom. It was along with a special silver GameCube, and quickly became my most played with, most loved gift. The game itself was actually a compilation of the Legend of Zelda, The Legend of Zelda II: The Adventure of Link, Ocarina of Time, Majora’s Mask, and a special demo for the upcoming Wind Waker. So, what are your thoughts on Navi? If you’ve played the game, did you like her or not? If you haven’t played, any thoughts on her character design? You may not know, but I’ve been keeping a specific sketchbook for doing studies and following tutorials. My thinking is that when I use that sketchbook, I already am approaching that drawing from a perspective of ‘time to improve’. Alternatively, I’m also using a different sketchbook with the intention of pushing my imagination and trying out ideas. But more on that another time. I’ve really enjoyed it so far. As an artist, it can be hard to find the motivation to create when you put pressure on yourself. That normally, for me anyway, is the feeling of wanting to be creative or good enough. More specifically, the fear of not being creative or good enough. By following tutorials and doing studies of both pictures and other people’s drawings, it’s like erasing two metaphorical birds with one pencil. If you focus on the intentional recreation of something, you can immediately disregard the pressure of creativity, if you want, which can help with motivation. (Some people use references as studies for developing their own style, but I’m talking about faithful, look-a-like studies here.) At the same time, you will be fueling the growth of your drawing skills. I like to jump around between things I know I need to get better at, like dynamic poses and clothing folds, and things that are fun and still good to learn, like miscellaneous objects and animals. For example, I felt really inspired to draw some horses. 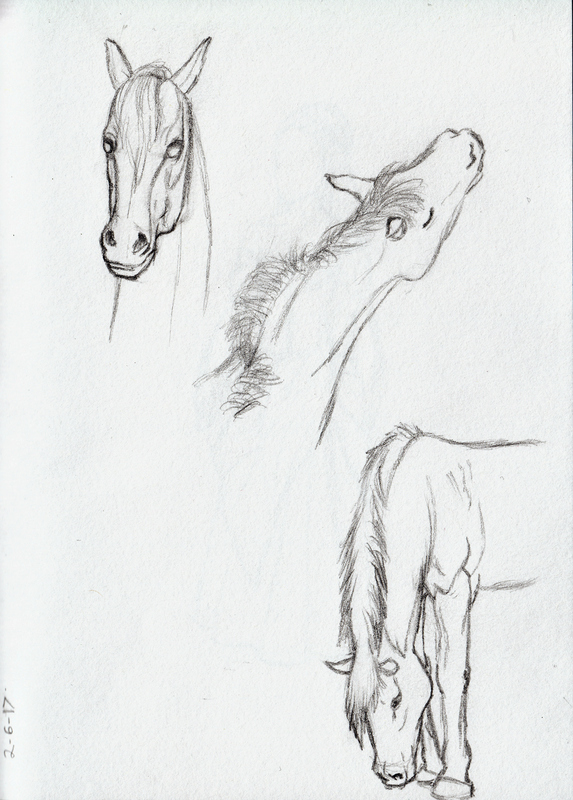 It was tempting to go and sketch what I think horses look like, but instead I chose to practice how they actually look. Both options would be fun, but I’m really trying to make an effort to get better. I find that there are a lot of great resources created by other artists when it comes to anatomy. You do have to be careful, sometimes, to make sure they’re a reliable resource. I used a tutorial sheet by Smirtouille on DeviantArt for my horses above, and I definitely want to revisit it in the future. Learning how to draw doesn’t happen overnight, but doing studies definitely helps me feel like I’m moving forward. Do you often do studies? Or do you keep specific notebooks for different types of drawings? Let me know below!